The Magic Hutch: Happy Memorial Day! This weekend we celebrated one of my favorite holidays. I love Memorial Day for many reasons. First, and most importantly, we as Americans take a pause and remember the men and women who now and in our past have so bravely protected and defended our democracy and freedom. We also remember those who are no longer with us who have lost their lives in the service of our nation. My table this week celebrates the red, white and blue colors of our flag and is my very small way of paying homage to this special day in May. The dish stack started with a cobalt blue glass charger that I found while antiquing in my favorite antique mall in Ventura, CA. Next came a plate that is a true workhorse in my tablescaping arsenal. It is my white Metaceramica dinner plate, made in Portugal. On top of this layer I added a new addition I found in HomeGoods. It is also a Metaceramica plate, made in Portugal. I love the design on the edge and the pretty shade of red of this salad plate. I'm glad I had a special occasion to showcase it. The next layer of my presentation is made up of two dishes. I only had three of the blue dishes, so I used two blue dishes for two place settings, then used white appetizer plates for the other two place settings. The blue dishes are labeled Booths, "Lowesteft Deer", Made in England the white dishes are labeled "Two's Company". Both sets came from an antiquing trip in Carlsbad, CA. I completed the dish stack with a cobalt blue glass sherbet dish, also found while antiquing. My place setting was finalized with white-enameled flatware from TJMaxx, red goblets from HomeGoods and two napkins intertwined to highlight the red, white and blue color scheme. 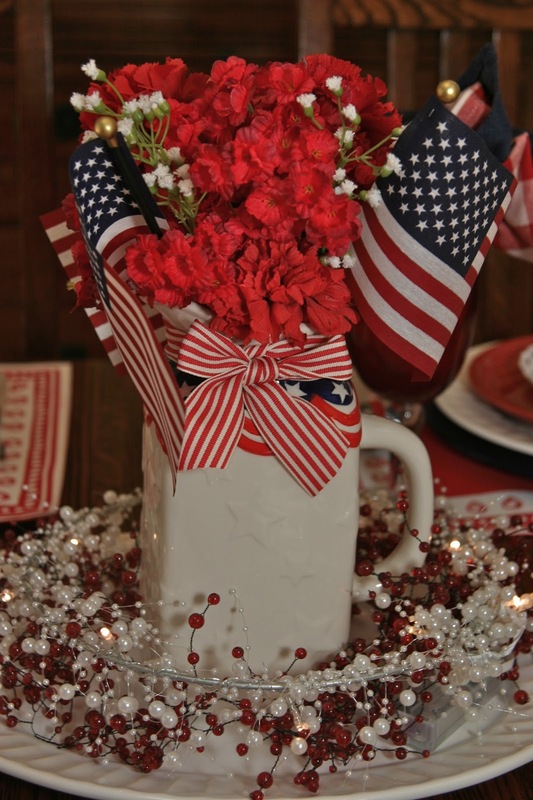 My centerpiece was anchored with a white pitcher found at TJMaxx and decorated with a flag swag design, and filled with faux red and white flowers and small American flags. I also added red candles standing in glass star candle holders found at a church rummage sale. To add a feeling of celebration, I encircled the white pitcher with two bead garlands. The white garland lights up and adds to the celebratory atmosphere. This centerpiece will probably stay on the table for the week to help commemorate the holiday. Accent pieces on the table include a star glass dish and a lovely glass bowl that was gifted to me by a very special aunt. Aunt Toshi came by with numerous plates and serving pieces that had belonged to her beloved mother. I so appreciate all the things she gave to me because she knows my fondness for anything having to do with a table! I will share the other treasures I received in future posts. Thank you so much, Aunt Toshi, for gifting me with these special pieces that meant so much to your Mom. I hope your Memorial Day Holiday Weekend was a good one, spent with those who mean so much to you. And, that, at least part of the day was spent in remembrance. Susan's Tablescape Thursday at www.betweennapsontheporch.net. Thank you, Ladies, for once again hosting these fun parties!! Your efforts are appreciated. What a great table! Love the centerpiece :-) It's been a nice holiday weekend. We traveled a bit and went by a couple of cemeteries and saw people out there visiting grave sites and bringing flowers. A good time to remember all our loved ones that have gone before us. Happy Memorial Day Rosie! Your table is red white and blue fabulous! Love love the centerpiece, the place mats and the red and white checked napkins especially! Your plate stack is gorgeous too, I hope you had a wonderful day! What an eye-catching Memorial Day table. It is so striking. I love the use of your large red and white check napkins against the cobalt blue. So wonderful for the holiday. Happy Memorial Day. This looks so very festive! I love the red plates! Rosie: Love the table and the the sentiments. Beautiful job. Beautiful table, Rosie! Love that your placemats got double duty. My mom had a bowl similar to the wide, shallow bowl your aunt gifted to you. Mom always served her 'carrot salad' in it; now that I have it, I serve that same recipe in it, too. Hope you enjoy that bowl as much as I do! So festive! It would work for 4th of July too! Thanks for sharing at Dishing It & Digging It! Beautiful Americana tablescape!....and I love the flatware...I need to take a trip to TJ Maxx to see if I can find them..they are beautiful.